How to Bypass Facebook CAPTCHA?- send as many friend requests you want & download videos on the go! Over the past few days Each time I update my status with a link, CAPTCHA is prompted. This is one of the major frustrations and now it has become a pain in the a**. So i decided to find some solution. 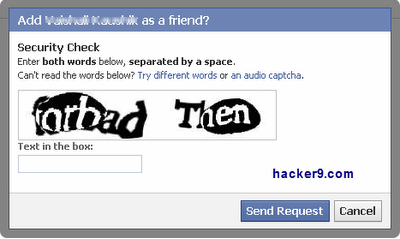 The reason Facebook uses CAPTCHA is because they are trying to control spammers. Unfortunately they are making it more challenging for users to interact with their friends. Users are getting frustrated with the boxes as they are regularly prompted to enter words which are occasionally illegible and annoying. Simple Trick is to visit facebook’s mobile version from your desktop PC ! You can bypass CAPTCHA’s by going to facebook’s server which is designed for cellphone users. What else you can do with touch.facebook.com? You can download the videos on the go. To download you just need click on the video, your download will start automatically. Since it is mobile version it improves the Speed if you are using Dial up connection an you can add friends very fast. #Also read : How to Remove captcha – verification words?